Hey Lovelies! 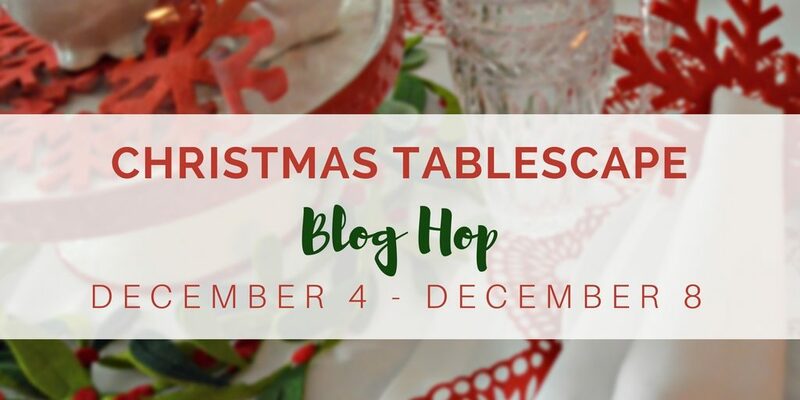 We are sooooo excited to be part of a Christmas Tablescape blog hop with all sorts of LOVELY bloggers! Special thanks to Chloe from Celebrate And Decorate . Check out the entire list of amazing Christmas tablecapes in the list below. We cant wait to show you our rustic winter Christmas tablescape! 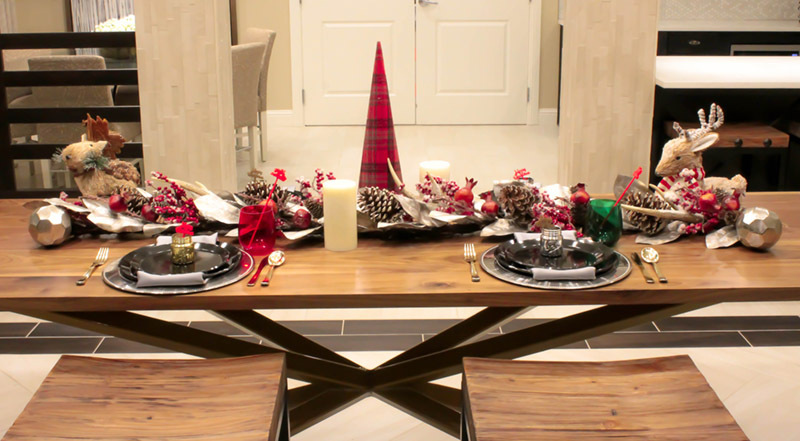 Our tablescape is a beautiful rustic winter Christmas theme. 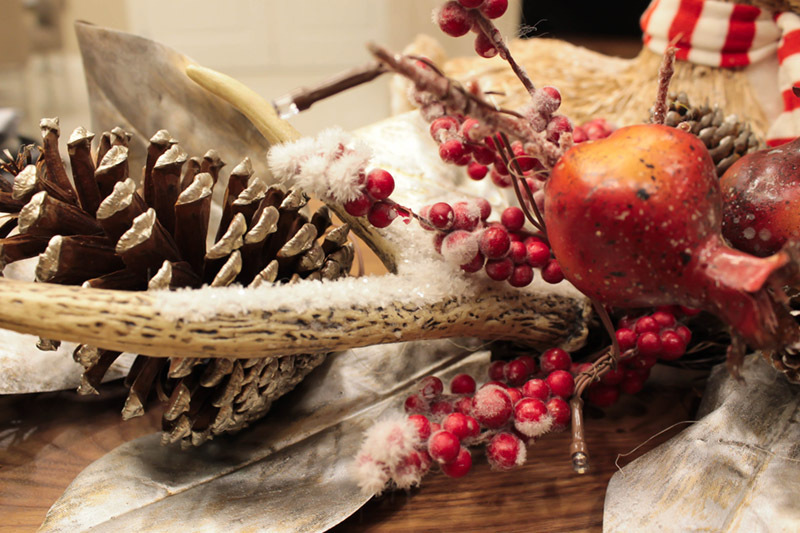 With frosted magnolia leaves, berries, antlers and pine cones, and rustic animals, each one makes their own statement on the table. We really focused on the silver with our place setting and accented it with black plates and shimmer grey napkins to match the frost on the centerpiece. The gold flatwear brings out the chicness to the place setting. 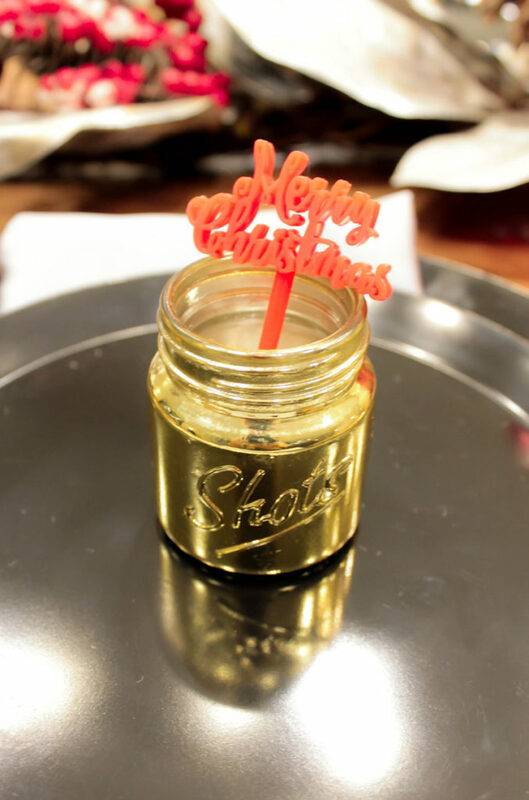 We just love these metallic mason jar shot glass to the plate. Perfect for adding a little soup, hot cocoa or anything celebratory! Add in some Merry Christmas drink stirrers and you really have a festive look! The berries, pine cones and magnolia leaves are so fabulous on this centerpiece garland. We just love these stemless glasses too in red and green. They bring a little ho ho ho to the table! Specifically with a Merry Christmas drink stirrer. How adorable is these cute little deer? It adds so much to the table and is so adorable! 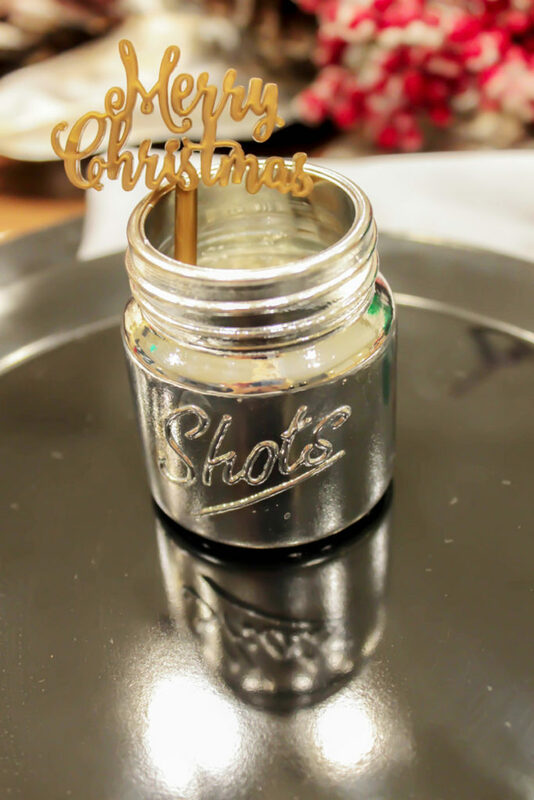 In gold or silver, these Christmas shot glasses are too adorable! All the details together are so lovely! 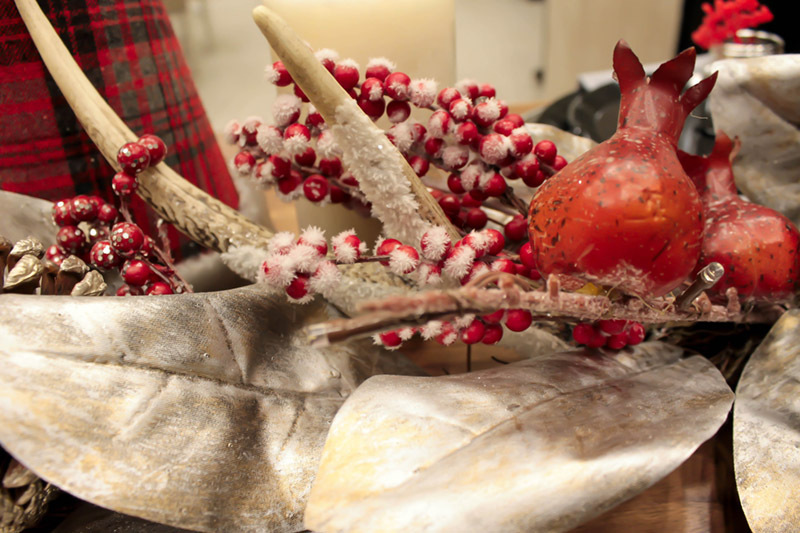 What is your favorite rustic winter Christmas tablescape piece? 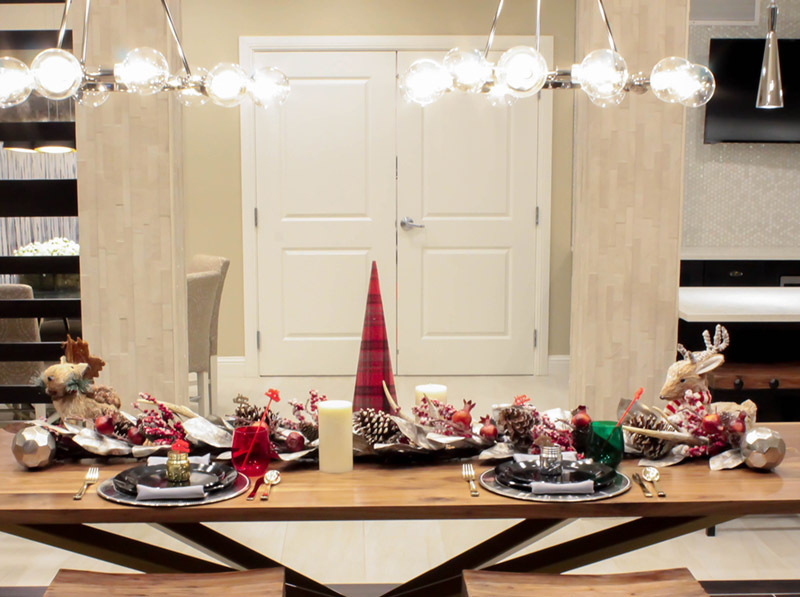 Check out all of the other lovely Christmas tablescapes below! Inspiration Of The Day- Nautical Christmas Tablescape Inspiration Of The Day- Lovely Christmas Tablescape Holiday Tablescape Blog Hop: Lovely & Easy Christmas Tablescape! Rustic Christmas Signs We Love! Have a happy holiday season, Emily. Thanks Rita! They aren’t recycled wine bottles but that is a great ideas!! 🙂 Happy Holidays! 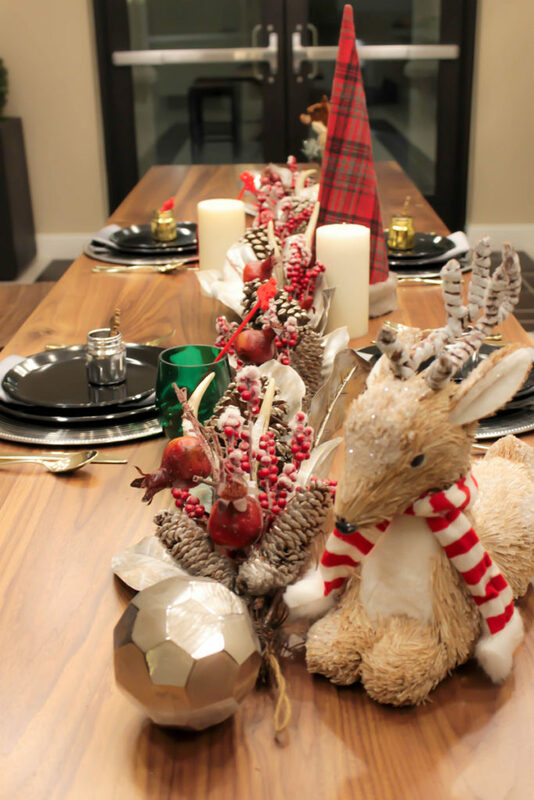 There are so many elements about your tablescape that I adore – the plaid cone tree, the antlers, and yes that sweet little deer! You did a beautiful job! 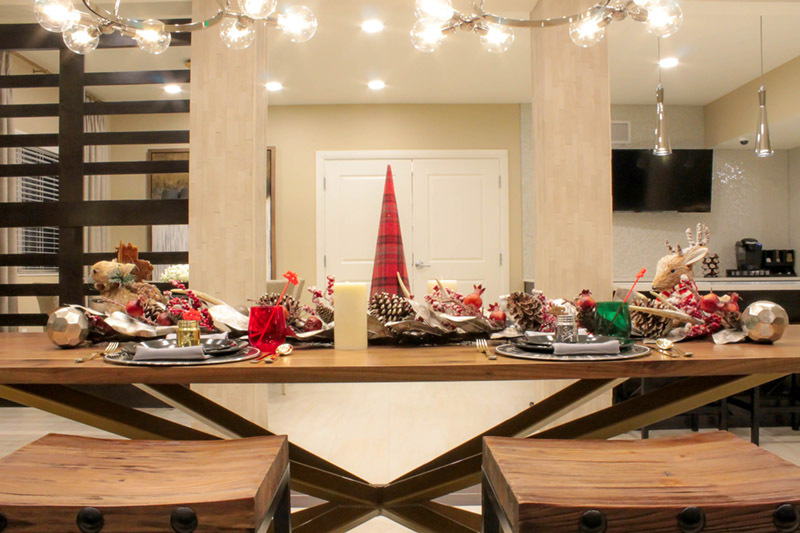 The mixture of shiny pieces like your plates, chargers and shot glasses against the woodsy centerpiece with greenery, antlers and deer are a lovely contrast. 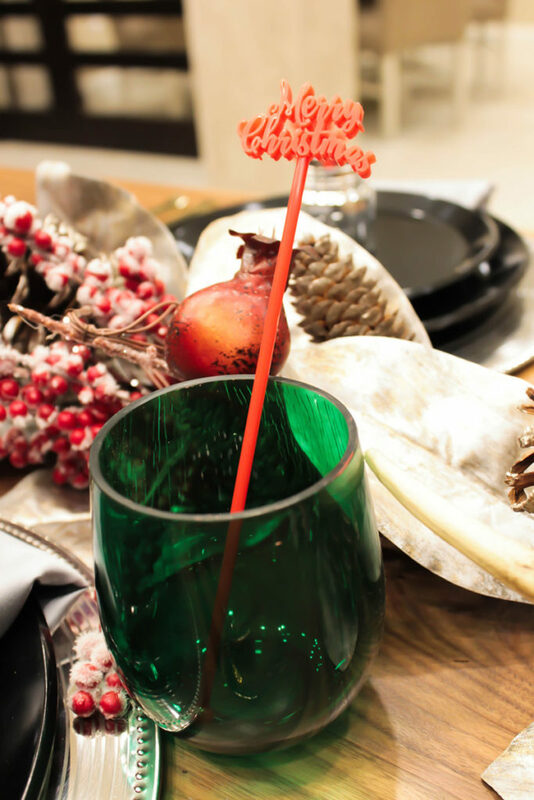 The red and green stemware adds a pop of color. Merry Christmas to you and your family. I love the stemware too. Thanks for appreciating the contrast. That is what I was going for! Each piece on this table came together in a beautiful way to convey your theme. The woodland creatures anchoring the table are adorable and count me in on loving those stemless glasses. It’s been a pleasure blog hopping with you and Merry Christmas! Thank you Sandra. Your comments are so kind! Marry Christmas! I love the woodland theme that you have created for your table. The plaid tree immediately caught my eye. I have enjoyed blog hopping with you! Wishing you a Merry Christmas! Thank you Pam! Merry Christmas! I love this modern woodland styling, dramatic and fresh! The shot glasses are very fun! Thank you Jenna! I love the shot glasses too! 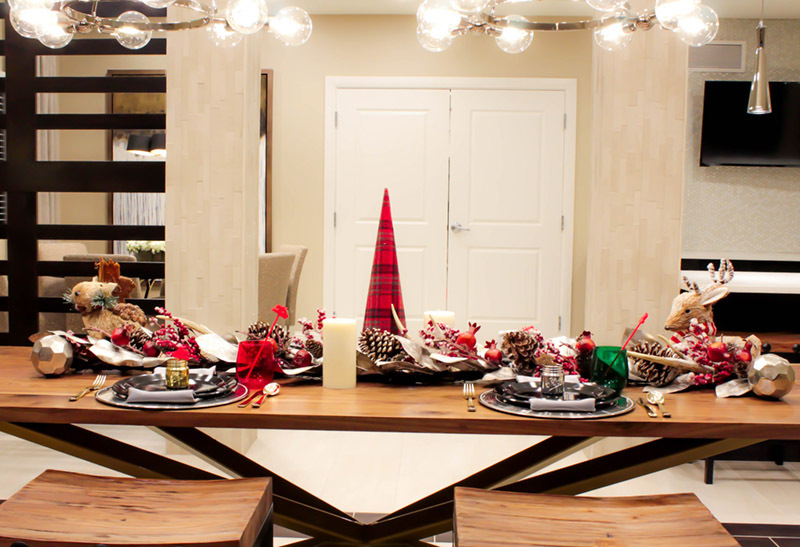 What a beautiful and festive holiday table! I love the cute little deer. They are the perfect finishing touch! Merry Christmas!!! Thank you so much Shannon! Merry Christmas! Those cute, little deers sure add a whimsical look! Melanie, the deer totally stole my heart this year. Love it! Your plaid tree drew me in! I like the frosted garland you used as a centerpiece, along with your cute little deer. Have a wonderful Christmas! I love the paid tree too Ann! What a beautiful tablescape. the deer are adorable…and the plaid Christmas tree is perfect. The frost is perfect too. Merry Christmas to you and yours. I love the snow-covered red berries in your centerpiece – they totally speak of a rustic natural Christmas look and I like how you paired them with the antlers. Fantastic dish stack with the metallic and black. Those little shot glasses are adorable and would definitely add a fun element to the dining experience. I really enjoyed my stop here on the Blog Hop! Lori, your comments are so kind. I love your attention to detail. Love being on this blog hop with you! Your table is just darling! I love the sweet red and white stripped scarfs on the reindeer. So cute! So fun to blog hop with you! 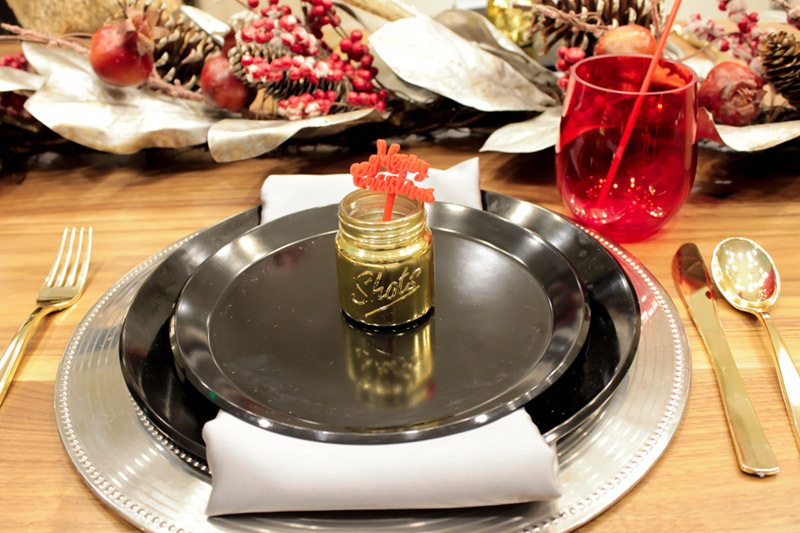 Emily, those shot glasses are so cute, really creative and add such glitz to the tablescape. Love your cute reindeer too. Gold and black is always a classic. Carol, those shot glasses are my favorite too! Your tables are always so creative and beautiful. I love your woodland magic! Wishing you a bright and happy Christmas! AWww you are so kind!! Your tables are always wonderful too! 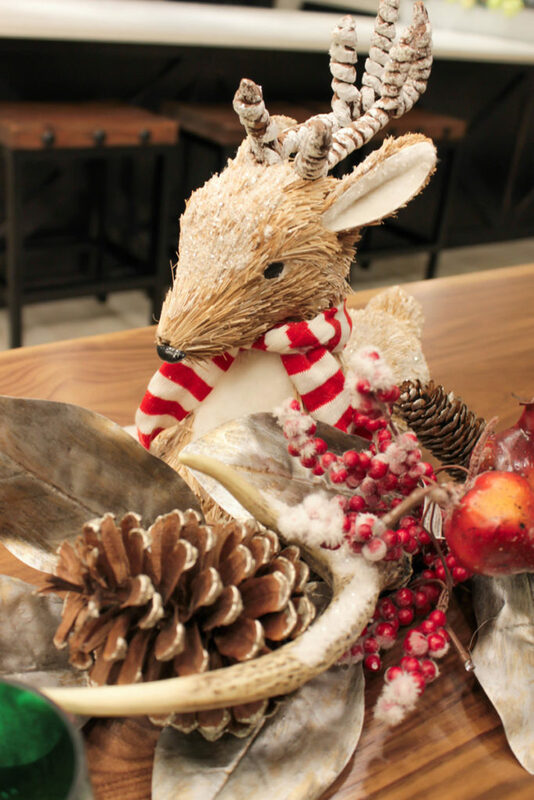 Emily, you surely nailed your rustic winter Christmas theme…it is warm and inviting, with a touch of whimsy. Not too stuffy, but clearly ready for festivities. 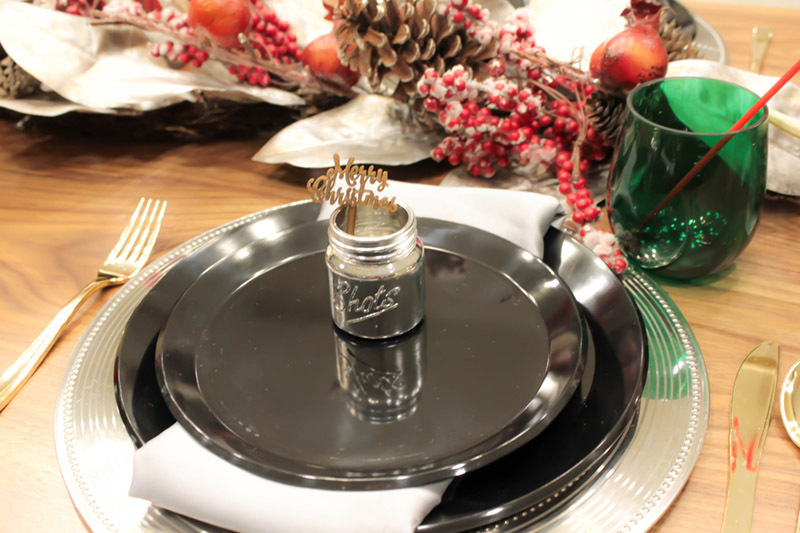 Your tablescape is really warm and welcoming and little metallic jar are beautiful! Emily, I love the rustic look you gave to your contemporary table. Those deer are adorable, and I love the frosted look on the antler and berries. It’s been great being in this blog hop with you. Thank you very much for being part of the Christmas tablescape blog hop! I love the little deer you found for your centerpiece, so enchanting. It is always fun to see your modern and trendy ideas, very inspiring. I know I’m kinda late to the party, but you know how it is…December is a sneaky little beast, LOL.